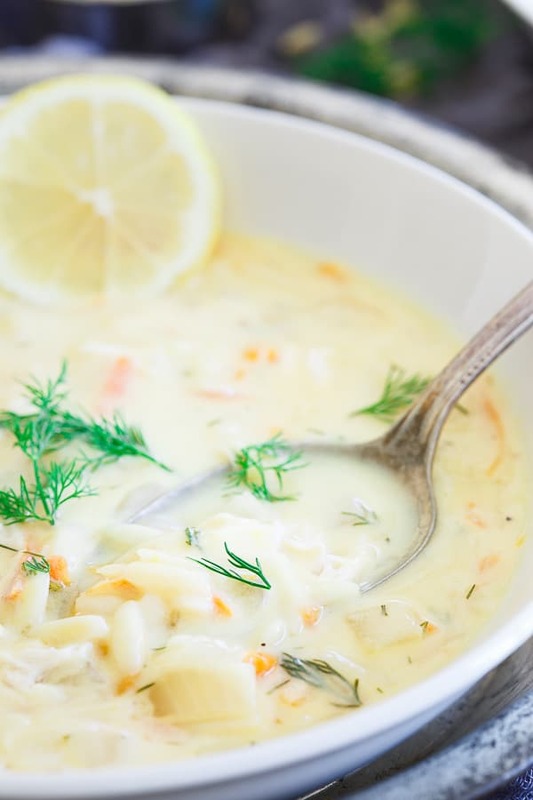 This classic lemon orzo Greek soup traditionally made with chicken is a great option for leftover Thanksgiving turkey. 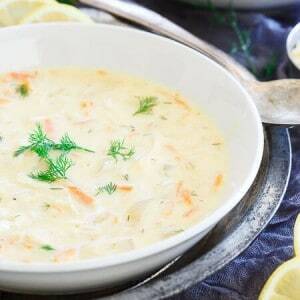 It’s creamy, light and bursting with lemon and dill for freshness. I feel very un-American saying this but usually white, creamy soups freak me out. Pretty sure it all traces back to a long ago run in with a can of cream of mushroom soup that I thought you just ate as is not realizing you’re supposed to add water. I gag a little just thinking about that. A few years after that experience I went to Greece right after my high school graduation. Among moussaka, patstisio and what seemed like a million Greek salads over the course of 10 days, I had a single bowl of avgolemono soup that completely changed my tune about creamy white soups. It was creamy, but not overly so, bright and fresh thanks to lemon and dill but hearty and filling thanks to the orzo. I’ve had a few bowls since in the U.S. and unfortunately not a single one has compared, not even the one I got AT a local Greek festival. When you add eggs to hot liquid it can either be amazing or a hot mess. Unfortunately, I seem to have tried the hot messes. Don’t be freaked out by the egg thing either, if you temper them correctly (and that’s not hard, just takes some constant whisking) you’ll be fine. If you’re lazy about it, you’re gonna end up with scrambled eggs in a lemon soup and that’s not only weird, it’s gross. Don’t be lazy. Avgolemono usually has chicken in it but what better time to switch things up then Thanksgiving when you probably have pounds upon pounds of leftover turkey sitting in your fridge? I was so excited to have Ulysses try this one knowing that I willingly made a traditional Greek dish and he didn’t even have to drop hints about wanting it to get me to. Since you can’t trust a dill hating Greek, take it from me, this turkey avgolemono soup is amazing. If you’re not hosting, make sure you grab some leftover turkey from whoever is and put this one on the menu for sometime over the long weekend! 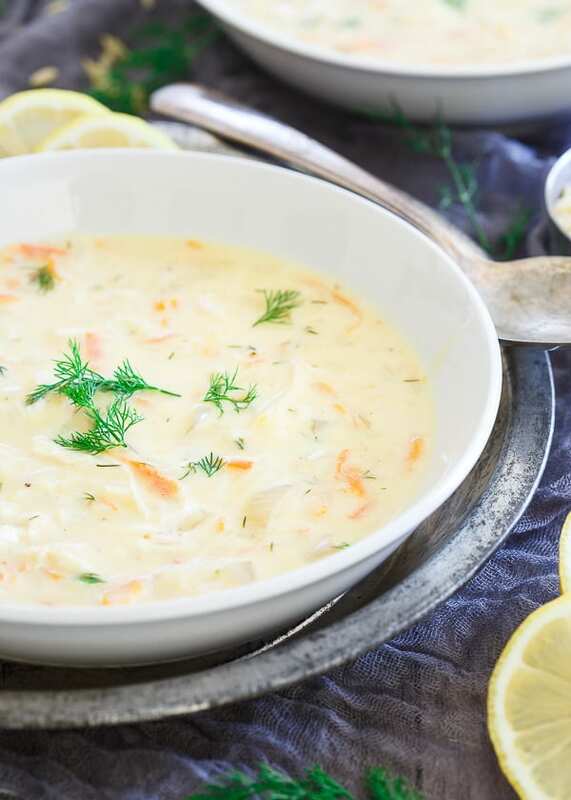 This classic lemon orzo Greek soup traditionally made with chicken is a great option for leftover Thanksgiving turkey. It's creamy, light and bursting with lemon and dill for freshness. Add the onion and cook until softened and translucent but not browned, about 3-4 minutes. Add the carrots to the pot and cook another 2 minutes. Add the broth and water then bring to a low simmer. Remove about 1 cup of liquid from the pot with a ladle and transfer to a blender. Let cool a few minutes then add the eggs and lemon juice to the blender and blend until foamy, about 30 seconds. Set aside. Add the orzo to the pot, stir, cover and let cook until tender about 7 minutes. Remove the cover and slowly pour the egg mixture from the blender into the pot over low heat, whisking constantly as you do this. Don't pour too fast or over too high a heat otherwise, you'll end up with scrambled eggs in your soup! Add the dill to the pot and season generously with salt and pepper to taste. Lastly, add as much leftover shredded turkey as you'd like and stir to combine. Soup will thicken as it sits and especially once refrigerated. What a delightful soup – love the eggs added in to give it it’s color and creaminess! OH my gosh fantastic recipe! Such a creative use for leftover chicken. Comfort food at it’s best! Love this Gina! looks like a nice light option for the day after the feast! Love all Greek food in general and have eaten so many Greek dishes over the course of 2 trips to Greece. This soup is a classic that I know and love! How can a first generation Greek not like dill?! What?! Don’t worry I take your word for it on this soup! Wow, looks nice and creamy, great comfort food. Nope, it will be fine reheated as long as you temper it properly when making the soup. I’ve reheated multiple times without issue! 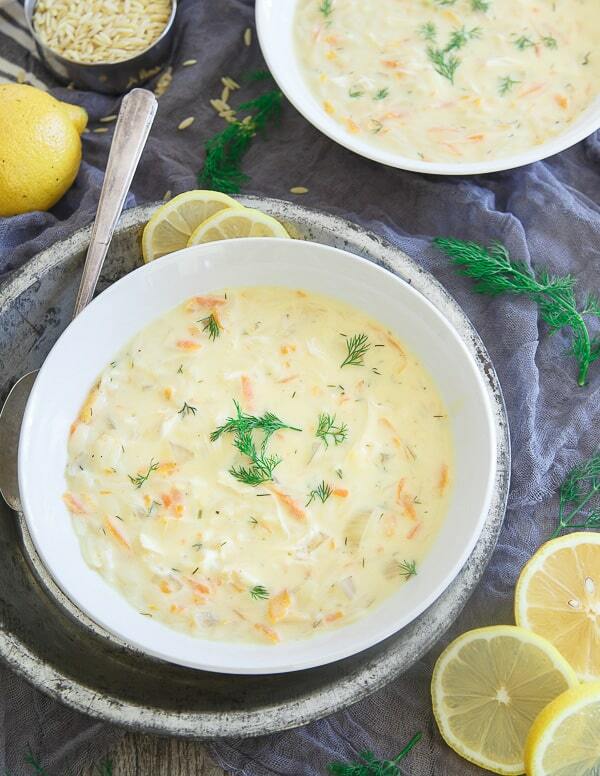 I LOVE avgolemono soup! I’ve never had it in Greece: only in my own kitchen. I like to use basil in it; you might try that on Mr. Dillhater. I’m sure it’s not traditional, but I like to add a little spinach, too. More veggies in the bowl! Genius idea to use leftover turkey, too! Love the idea of basil! Definitely trying that next time.